20130602, 09:42 – The QAR is hung up real good. Better zap the PRAM! 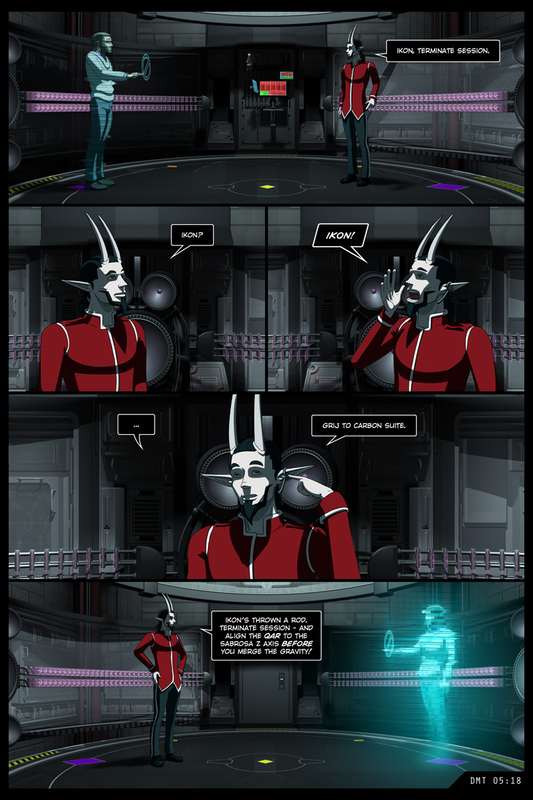 In the last panel, Grij is referencing the fact that while in operation the QAR is isolated from the Sabrosa’s mass influence and has its own artificial gravity. This is implied but not explicitly stated in chapter six of The Dualist. 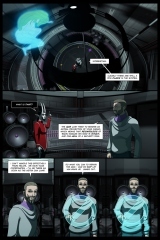 This page also establishes that thirty minutes have elapsed between Alias boarding his Banshee and Grij calling for the QAR to be turned off. Given the pace of the scene it can be safely assumed that most of that time is between panels three and four of water -1-. Here endeth scene one, and four weeks of two pages per weekend. I’m moving deployment to one page per weekend for the foreseeable future for scheduling reasons – at this point three pages of the next scene are ready to shade, three need to be drawn, and I still need to prep environments and render the remainder of the chapter. While I’d like for production to be seamless, removal of sleep isn’t possible. Kicking things down to weekly, however, gives me six weeks to figure something out while keeping the pages coming at a sustainable pace. Hopefully things will keep rolling without a hitch! The original layout for this page was more of an overt segue into the next scene. As it stands right now it’s a compositional counterweight to the previous page, which should work fairly well in hardcopy. You can get some idea of what the L/R page flow looks like on the current build of the chapter thumbnail page. A good decision to push pages out weekly. I actually have this on an RSS feed but would love to get this in my regular trawl list. 114 queries in 0.842 seconds.